Writing isn’t typically seen as the most tech-fuelled area of media. Most writers and bloggers get by with their laptop, Grammarly and Google Docs (can you guess my process?) but that doesn’t mean there aren’t gadgets available that can make life easier - or at least more fun. Granted, most of the best new books of 2019 probably won’t be produced using this stuff, but adding a bit of diversity to your writing experience is never a bad thing. If you can find a gadget that makes you want to write, or if you come across a piece of new tech that gives you an urge to put words on page, then surely you’re more likely to crank out your best content? With that in mind, here is a short but oh-so sweet list of tech that could leave your writing process feeling a little more fulfilling. There is something lost in modern writing, thanks to the advent of computers and smart devices. Writing itself hasn’t changed on a fundamental level, but the way it feels to put word to page has. You rarely write anything on paper these days, not least a blog or a book. You’ve got to admit, a bit of the satisfaction is lost in the death of old-fashioned writing methods. 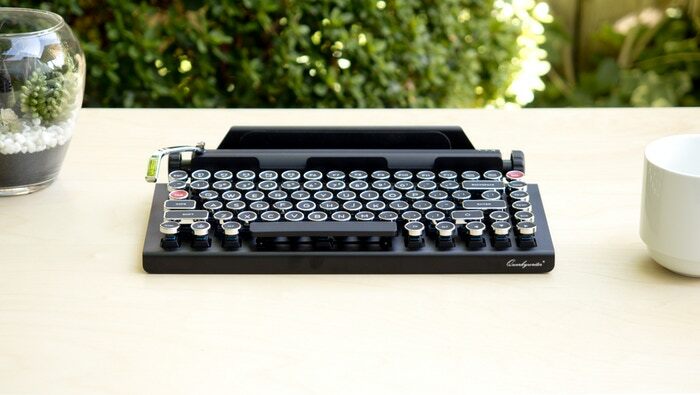 With QwerkyWriter, though, you can reclaim a bit of that charm of yesteryear. This is a typewriter that looks and feels like your classic machine. However, it connects to your computer and smart devices, so you can clack away like you’re living the 20s, writing the next great American novel, but you aren’t risking your entire life’s work blowing away in the breeze. LiveScribe is a phenomenal piece of tech that I really cannot recommend enough. Many writers face a conundrum when it comes to ideas and notes. They want to write them down quickly on paper, but damn it all if they don’t often find they lose that paper or even just forget it exists. LiveScribe is a pen that, on the surface, works like any ordinary pen. It has ink, and it makes patterns and shapes when you squiggle it around. Sometimes those patterns and shapes actually make up coherent information you can use later - on a good day. The thing about LiveScribe though, is those notes are all stored within the pen on its memory card. It traces your handwriting and creates data based on what you’ve written. You can then connect said memory card to your phone or computer and access the notes you’ve handwritten in digital form. It’s the perfect way to marry physical note-taking and digital longevity. Write or Die is a piece of software that is also available as an app. It works by effectively punishing yourself for not writing. If you pause for too long, the program will start deleting the last words you’ve written until you start writing again. Effectively, you’ll end up purging your own work if you don’t actually do the work. I wouldn’t recommend this for faint-hearted writers, but if you are known for struggling to concentrate, or have a deadline you’ve got to hit, being essentially held at gunpoint to keep the words flowing might just help you burn through pages. Fan of fantasy? Why not read short stories online right here! Or download the free fantasy eBook.